Stormy February and Another Snowstorm Tomorrow! Hi everyone. This has been quite the winter so far. February will mark the transition from a colder and drier pattern to a warmer and wetter one. The next two weeks will be extremely active with multiple threats for snowstorms. While the transition to spring has begun, we still need to get through another few weeks of snowy, stormy weather before the warmer temperatures arrive. The next storm is expected to arrive tomorrow morning and drop a substantial amount of snow. The system is part of a shortwave coming off of a cold front that will pull through later tonight. The storm will be fast-moving and intense. 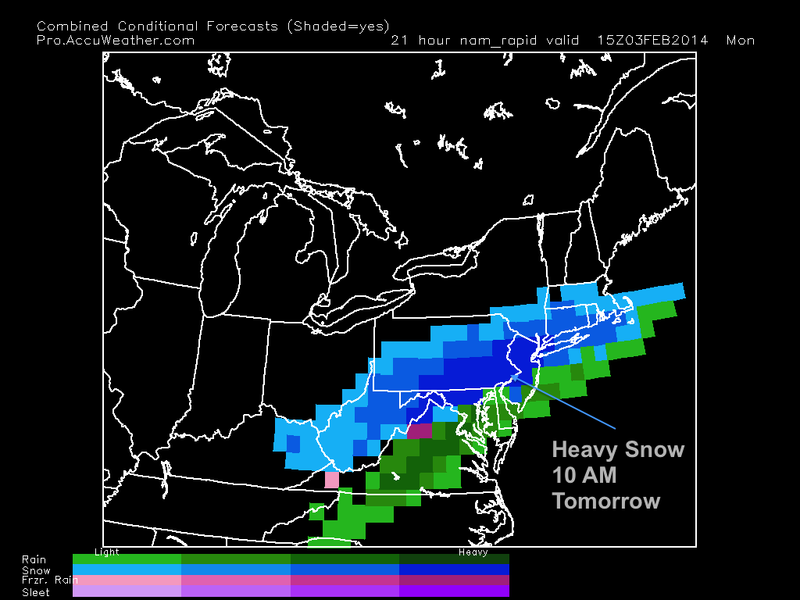 Heavy snow will fall during the midday hours tomorrow and accumulate a good amount by nighttime. 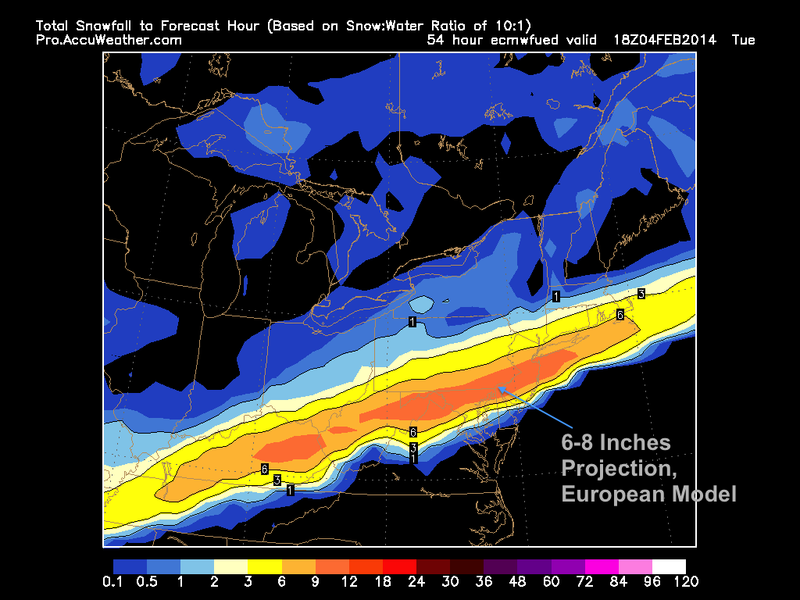 Most models have been projecting a general 6-8 inches with some isolated areas of 8-10. Totals will be held down in South Jersey because of mixing issues. The heaviest snow will arrive around mid-morning and continue into late afternoon before ending abruptly. Because temperatures will be held near freezing, the snowflakes will likely be large, wet, and heavy. I do not recommend driving on the roads during the day on Monday. Another, much stronger storm system will threaten the region with ice, rain, and snow on Wednesday. The location of the low pressure will be pivotal in determining the precipitation type for the area. Right now, it is looking more likely than not that we could see some ice accumulation followed by rain. Details will likely change over the next day or two as confidence levels rise. In terms of the current teleconnections, the NAO (North American Oscillation) has been positive for most of the winter and looks to continue to stay positive into mid February. With a positive NAO, the high pressure needed to produce very large nor’easters on the east coast is weakened or absent. For the rest of the winter, expect more quick hitting storms like the one tomorrow. My feeling is that there will likely be one last large storm near the end of the month that will put an end to this chaotic winter we’ve been having.